I wonder sometimes whether skill with accents can be learned or if it’s just innate—you have it or you don’t, like the ability to keep a beat. If I were to guess, I’d say it has to do with a totally different part of the brain than grammar or vocabulary. Maybe the same part of the brain that regulates how good you are at doing impressions. I imagine you have to have an ear for it, meaning you’d have to be able to notice and pay attention not just to what people are saying, but also how they’re saying it, and then reproduce it yourself. Or that might be even more confusing. Point is, the ability to reproduce this tongue-song is a special skill, and completely independent from having a wide vocabulary or knowing grammar rules. I know an American fellow who’s lived here in Berlin for 25 years, has a German wife and five bilingual kids, and teaches in German—he’s totally fluent, and yet his accent is so harsh, it sounds like he just picked up the language yesterday. I have another friend who doesn’t speak any languages fluently, but is killer at accents. He can do all the various English regional accents to perfection, and when he tries to speak Italian or French, he can even fool a native speaker, if just for a moment. As the comic above tries to point out, no one group of people is “good” or “bad” with accents. If you think Americans are bad with accents, you’re probably just remember that one American with a terrible one (maybe we know the same guy…!). I’m not an accent whiz, but I’d say I’m better than average. To me, it’s important to get that cadence down, as well as proper pronunciation, so I listen very carefully to native speakers and try to reproduce their song when I speak. It’s helped a lot. Native speakers can tell I’m not native, but they don’t know where exactly I’m from, and that helps me build a unique first impression that isn’t founded on some cultural stereotype. What do you think? How’s your foreign accent? Do you know people who can’t pronounce to save their lives, or others who are accent geniuses? Is it possible to learn it, or are we just born with this skill? I am always amazed at people who go into espionage and manage to pass a native speakers when they’re not. And I know an adult who came to the US at age 10 but still speaks with an extremely heavy Russian accent. You’d think he got off the boat last year. He just can’t hear what he’s doing wrong. Funny that you guess Holland would have a good German pronounciation. There are some Dutch TV stars who speak perfect German, but with horrible accent (although it’s suspected that they speak like this on purpose). Infamous are people from Asia, who have perfect knowledge of English, but with ununderstandable pronouncation. (Perhaps not because of lacking personal ability, but the fact that their schools only teach reading and writing, and not speaking). @Ikar.us A couple of years ago I attended an international conference in Holland. The taxi-driver who took me from the airport to the conference was Dutch, but could have passed for English with his impeccable British pronunciation. When I suggested he must have lived in England for years, he told me he had never been there, but had listened to BBC a lot. Conversely, the highly educated man who chaired the conference spoke with an accent so heavy that I had trouble understanding him. I myself am a Norwegian polyglot and very aware of the importance of pronouncing a foreign language as correctly as in any way possible. My Hungarian, albeit fairly fluent, is full of grammatical blunders, but I am often told my pronunciation is very good. I believe native speakers pay more attention to a foreigner’s mispronouncing than to their grammar mistakes, – I, for one, do so when I hear a non-Norwegian person speak my language. I really like your graphs to depict the cadence and sound of the spoken words. 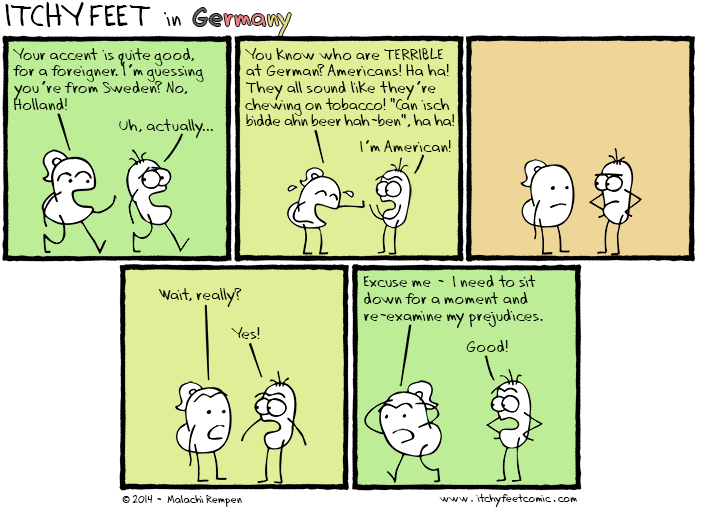 As a German, I could completely relate to the last one and I think it is a great way to visualise language! I think when learning a language, one should generally pay more attention to how things are being said from the beginning, otherwise it will be very hard to “relearn” the proper accent later. With French, you’d have a big flat line. So there’s more to a language than just cadence and “melody”. I have an acquaintance who believes that the ability to pick up accents is related to musical talent (or perhaps simply to musical experience). She’s noted that the people most likely to acquire the local accent when they spend much time in a particular area also tend to be people with musical inclinations. @Audrey Nickel Interesting…that makes sense, but I don’t know why. @Malachi Rempen I’ve always been told that I have a good ear for languages, and I think that pronunciation is one of the least difficult things for me when working on a new language. I am however, pretty useless when it comes to music. No musical talent whatsoever. My Russian friend thinks I have good Russian accent, so do Belarusian children who stay with me. Personally I think I’m not too bad at some words NIR so good at others. I live in Ireland but was born in England. In Ireland, people know I have a bit of an English accent but funnily enough in England they think I have an Irish accent. I am fairly OK at taking off accents and sometimes imitate people from other countries quite unintentionally. I believe some people have a natural ability with accents so I think its more innate. Some people no matter how good they are at remembering the language just can’t seem to pronounce it let alone have the right accent! I still have a long way to go as there are certain Russian words I can’t sat properly in ant accent! Thanks for your interesting blog. I really agree that it is important to listen to how native speakers pronounce the language!! Watching movies and listening to music is great for that. It IS really hard to unlearn bad pronunciation. I have friends that have been learning Russian for 15 years and still put their stress on the wrong syllable in every other word. maybe it’s true that they just don’t have an “ear” for it. Btw I like the graphs too. @Karen Changing your pronunciation isn’t done over night, but it is doable. I made changes to my English pronunciation a few years ago after having spoken English for more than 10 years. I’Ve been told by native speakers of French, German, Italian and Japanese that my accents are pretty decent, and from certain regions of the area, I.e. Brussels. I wonder if that has anything to do with the fact that I learned Italian at a young age and have since been able to pick up German and French through colleagues and Japanese through study and living here? I also think that Music has a lot to do with the pitches and cadences and inflections made upon certain words, for example, japanese tend to speak in two tones, up or down. But they do out stressors or inflect certain syllables harder or softer to change the meaning of the sentence.